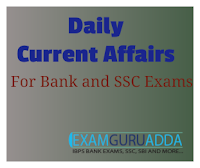 Dear Readers, we are presenting Daily Current Affairs for All Exams- 17th December 2016. 1. Having already exhausted a Rs 5,000 crore limit to issue ‘masala bonds’, mortgage major HDFC today said the Reserve Bank has granted it permission to raise another Rs 3,000 crore from the newly emerging route. 2. The rate of interest for the fund raising was 8.3 per cent in the first tranche, which came down till 7.25 per cent for the last one, he said, conceding that developments like the Fed rate hike and commentary about similar actions in the future make it a difficult route. 3. This is not probably the best time to raise fresh money in the context of the fact that Fed policy has come out and Fed has hinted at higher rates,” he said, adding that the company will be taking a call on the new fund raising from January, once the holiday season in the west is over. 1. The BCCI’s fight to stall the reforms recommended by the Supreme Court appointed Justice RM Lodha committee suffered a telling blow as veteran politician Sharad Pawar tendered his resignation from the president’s post of the Mumbai Cricket Association (MCA), here today. 2. The former ICC and BCCI president is one of the biggest name in BCCI administration and he has stepped down adhering to the norm of age-cap of 70 years as prescribed by the Lodha panel stating that he is “hurt” by the perception that people stick around in BCCI as it is “lucrative“. 1. The Pradhan Mantri Garib Kalyan Yojana (PMGKY) notified along with other provisions of Taxation Laws (Second Amendment) Act, 2016 came into effect from 17 December 2016. 2. It will remain open until March 31, 2016. PMGKY is Union Government’s second income disclosure scheme (IDS) to allow tax evaders to come clean with unaccounted wealth. It provides for 50 per cent tax and surcharge on declarations of unaccounted cash deposited in banks. 1. Indian Navy’s eight landing craft utility (LCU) L-58 was launched by Garden Reach Shipbuilders and Engineers Ltd (GRSE) in Kolkata, West Bengal. 2. It is the last vessel in a series of eight ships of LCU MK-IV project designed and built by GRSE for the Indian Navy. It was launched by Neelam Pratap Singh Rudy, wife of Union minister Rajiv Pratap Rudy. 1. Rajasthan Government has launched Annapurna Rasoi Scheme to provide quality meal at cheap price to poor and needy on lines with Tamil Nadu Government’s Amma canteens. 2. It was launched by Chief Minister Vasundhara Raje at Jaipur Municipal Corporation campus. The tagline for the scheme is: “Sabke liye bhojan, sabke liye sammaan (Food for all, respect for all)”. 1. Maharashtra CM Devendra Fadnavis, ISRO chairman A S Kiran Kumar , UK-based scholar John Ralston Marr and Hari Katha exponent Kamala Murthy have been selected for SIES-Sri Chandrasekarendra Saraswati National Eminence Award. They will be presented awards in different categories. 1. The Parliament has passed Rights of Persons with Disabilities Bill, 2016 after it was passed by the Lok Sabha. The bill aims at securing and enhancing the rights and entitlements of persons with disabilities (PwDs). 2. It also gives effect to the United Nations Convention on the Rights of Persons with Disabilities and related matters signed by India in 2007. The bill defines disability based on an evolving and dynamic concept. The types of disabilities have been increased from existing seven to 21.